Let the holiday baking commence! From now til Christmas, like many other cooks I'll be up to my elbows in flour and sugar and butter. And here's the first tray to emerge from my oven, butter tart bars, a bar version of traditional Canadian butter tarts. It's easy to make, perfect for cookie trays ... and utterly delicious. 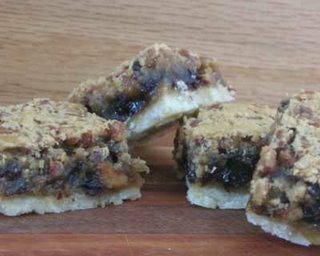 Along with memories of riding the bus to-from my Canadian grandmother's, the recipe is in this week's Kitchen Parade column. Looking for other Christmas ideas? Kitchen Parade has lots of holiday inspiration. If you're thinking about hosting a cookie swap, start here.